Interestingly, Walter Eastwood came to Lytham in 1902, approximately ten years after the Hall, which was unsuccessful as an open market, was turned into enclosed shops, though Walter may have visited and remembered a time when it was in use. You certainly feel this is the mood he is trying to capture within this sunny spring time scene - times gone by. We see the leaves on the four elm trees just coming into bloom, whilst the building is bathed in warm yellow sunlight with the shadows of the trees softly reflected onto the building walls; the blue and mossy green slate roof creating height and a three dimensional space. The focal point is the building and clock tower with the market set in a shallow almost empty street and space. We see the shopkeeper with his back to us looking at his fruit and vegetables displayed on a table resting on barrels and in boxes on either side of the shop frontage. The bright sunlight is contrasted by the interior dark shadows within the rounded arcaded windows and door suggesting the space within. Our eyes then rise and follow the trees and branches, similar to outstretched fingers, expressing space, height and movement revealing the clock tower and bellcote at the top. We sense rather than see people inside the shop. There are hints of activity, we are stopped in time and have no suggestion of when this scene occurred, it is in the viewer’s imagination. 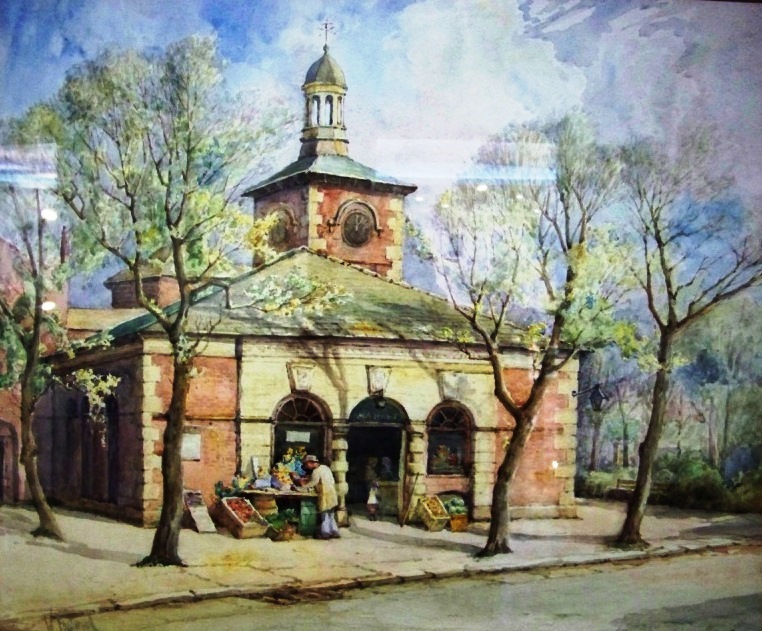 The pale mauves and blues of the sky set against the dappled leaves on the trees, together with the impressionistic style of the Memorial Gardens in the Square beyond, add to the ethereal lightness and peace of the scene set around the solid three dimensional structure of Lytham Market Hall on this important site.